WASHINGTON SLAGBAAI PARK - BONAIRE, N.A. Myron found this octopus on one of our night dives. Dive Journal: Today is our last permitted day of diving. It is a standard practice to avoid diving in a 12 to 24-hour period prior to air travel. This period is supposed to help allow absorbed nitrogen equalize out of the system prior to exposure to the reduced pressures inside a plane cabin. We start the day slowly, with a plan to do more shore diving. Linda and Rich take the bicycles back to Cycle Bonaire and purchase several of the attractive tee shirts they offer there. We also touch base briefly with Sylvane, then hit Cultimara again for some picnic supplies. I have been searching for a "Save Klein Bonaire" bumper sticker I've seen on local cars around town, and we jump into the van and head over the Carib Inn in search of one. At the dive shop there, I meet Bruce Bowker, known for his reef preservation efforts and buoyancy control workshops. The Carib Inn is also known as one of the most affordable and diver-friendly resorts on Bonaire. Bruce informs me that the "Save Klein Bonaire" bumper stickers announce opposition to planned building on the otherwise barren island. Unfortunately, no bumper stickers are available and new ones are out for quotes at present. Linda and I head back to the Sand Dollar. Myron and Mercedes are busy getting the diving gear ready and we spend some time gathering up 8 tanks and load them carefully into the rear of the minivan, wrapping them with towels so they won't bang around. We head back into Kralendijk to find a gas station, discovering at last "Lisa Gas," and we fill up. We're not far from the Carib inn, and so we make another stop there while Myron and Mercedes visit with Bruce Bowker and check out the dive shop and rooms. A nice laid back place, touted as one of the best values on the island. Heading off in the minivan, we proceed north and towards the interior of the island. The drive through Rincon is much more enjoyable this time in the sunshine. We are searching and searching and searching for a secret place called Prisca's Ice Cream, described as an island-favorite stop. We stop at a shop and ask an emerging women for directions. In heavily accented English and occasional Papiamento, she provides guidance, accented by arm movements and head bobbing. Rich, who is driving, nods and proclaims: "I know exactly where it is." We set off again and are soon lost. Winding through the unpaved backstreets, we stop at a residence and ask for directions once more. OK, this time Rich is sure he knows "exactly where it is." We are lost again very soon. With a final grin and shrug of resignation, we give up the hunt, and begin our trek out of town. At this very moment, we drive the minivan right in front of the entrance to Prisca's, which is tucked back between a collection of old buildings, with a rutted driveway that opens up into a dirt clearing. Prisca's is a greenish building with an old open porch out front. There is a smooth wooden halfdoor with a counter on its top, and a young employee is behind the bar. One old Bonairean gentleman is seated on the porch nursing an Amstel. The server lists the available flavors of the day, and we select cups of rum raisin, coconut, strawberry, and mixed fruit, evenly sharing spoonfuls of all the flavors among us. This frozen stuff is deliciously sweet and creamy, different somehow from American ice cream, and we relish the cool treat while sitting on the porch, watching a gang of local dogs patrol their turf. As we leave, Mercedes calls away to the server, "Save us some coconut - we'll be back." From Rincon, we head north another 4 km to the entrance to Washington Slagbaai National Park, which occupies most of the northern portion of the island. As we enter the park, we pay a $20 fee to rangers, who fortunately accept a $50US bill. It's about noontime, and the ranger informs us that we must exit the park by 5:00PM or risk being locked inside the gates. The park is a sanctuary of pristine Bonairean lands, preserved since the early 1900's. The cacti get so dense we can hardly peer through them and the road degrades into a rocky pathway. The minivan is marginally adequate for passage as we slow to a crawl and angle our way over many of the steep ruts. The slow pace is actually a nice way to see a bit more of the beautiful natural setting inside the park. Small hanging bananaquit nests are seen drooping from cactus limbs everywhere, and a variety of birds divebomb across the road as we lumber along. We spy glimpses of critters through the cactus thicket, a flash of fur here and there, but we can't seem to identify the animal. In time we emerge from the cactus and into more of a forest surrounding. We stop at a clearing with a beautiful natural pool, a place called Put Bronswinkel, and exit the van for a look. Rich spies a stunning orange-yellow and black oriole in the canopy over the road. Mercedes and Linda check out a loner cat that is primarily interested in a nearby grouping of doves. The pool is apparently a body of stagnant water, full of greenish algae, and the clearing is very quiet and peaceful. Continuing on the grooved trail, we round the northern reaches of the island, finally emerging onto the northwestern coast. We pass the first dive site, one called Boca Bartol. Veering southwest, we finally reach a gorgeous little isolated cove and a second dive site called Playa Funchi, and so we stop the minivan and emerge to investigate the area. Rains immediately pummel us, then stop, and so we unload the diving equipment and then pull the minivan onto higher ground. Inland is a sizable marshy flat where a flock of flamingos is tromping around in the shallows, while seaward there is a lovely blue cove bounded by rocky outcroppings. In the rain, we suit up in the shallows, and we are greeted there by an eager pack of smooth trunkfish. Probably not a “pack”, but more likely a harem, as trunkfish are known to assemble. These interesting fish secrete a toxic substance from their skin for protection. A team of eight or so of these beautiful but clumsy swimmers emerges from the shallows and encircles our dive party, perhaps looking for a handout. They are unafraid and friendly, and we somehow feel it is a sort of a greeting to the beautiful location known as Playa Funchi. The entry is easy over sand flats in the smooth waters of the protected cove. To conserve air, we carry out a surface swim before encountering deeper waters. As we swim in about 20 feet of water, we catch sight of a moving school. Squid! A couple dozen Caribbean reef squid hover about 3-5 feet below the surface, and slowly vector around us, keeping their distance. Although a common marine creature, it is unusual for us to encounter them so closely. Their beautiful undulating fins provide locomotion, and their bodies are a light shade of bluish lavender. 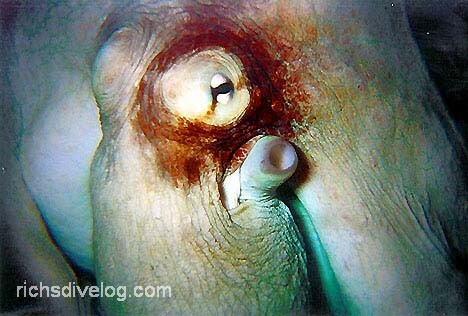 The large eye of each squid seems to check us out as they swim around us. We proceed over the reef to a bit over 70 feet, and enjoy another fabulous Bonaire dive. Among the new sightings are a bluish hued buffalo trunkfish, and a skipjack with the less common blackish coloring. Following the dive, we spy ballyhoos (or their cousins) in the shallows, and are then again surrounded by our friends, the trunkfish, while gearing down in the shallows. A truly great dive! It's possible for us to make it to a second dive site in the park, and so we gather our gear and pack up the van. Unfortunately, it takes us about 20 minutes to get to the next dive site, Boca Slagbaai, too much time to allow a second dive today. Instead, we enjoy a relaxing picnic of cold hot dogs, fixings, and bottled water, perched in a shallow rocky cave near the beach. As we dine, a stunning yellow and orange bird begs us for a handout from a nearby tree. It's a bumpy ride around the loop and back to the park entrance. As we grind along, Mercedes again spies fleeting glimpses of furry creatures evading the minivan. They're deer! Mercedes is sure of it. It'll be close to make it back in time for the park closing. For fun, we each make a guess on the time of arrival at the entrance: Myron: 4:51PM, Linda: 4:55 PM, Rich: 4:57 PM, Mercedes: 5:02PM. The closest guess without going over will win a wish of the winner's choosing. We reach the entrance at 4:52:06PM and Myron is crestfallen at losing a golden opportunity. Stopping in at the ranger station, Merecedes asks about the deer we have seen. "Deer?" The ranger screws up his face. "There are no deer! There are plenty of goats, though."